In our last edition, we featured research suggesting chronic back pain may lead to mental health problems including depression, stress and even psychosis. But the reality gets more grim, particularly if you’re a senior: Back pain may increase the risk of falling, and when you’re older, that can be a serious health issue with serious consequences. Here’s why: According to the National Institutes of Health (NIH), more than 1.6 million older U.S. adults visit the ER for a fall-related injury every year. In fact, falls are the No. 1 cause of fractures, hospital admissions for trauma, loss of independence and injury deaths among the elderly population. Now back to the latest study: Researchers tracked more than 6,000 men ages 65 and older, assessing their frequency of back pain, episodes of falling and other variables that could also influence fall risk (medication use, dizziness, disabilities and pain in other areas of the body). Men who reported back pain were 30 percent more likely to suffer multiple falls compared to men without back pain, and risk correlated with the prevalence of back pain: two sites of pain increased the risk compared to just one site, and three sites increased the risk even further. 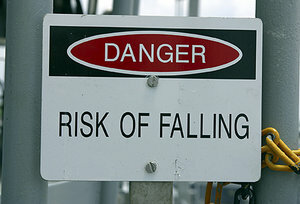 Increasing severity and frequency of back pain also increased fall risk, according to the study. The takeaway is simple: If you’re suffering from back pain, regardless of age, it’s time to visit your doctor of chiropractic. Your body will thank you for it.